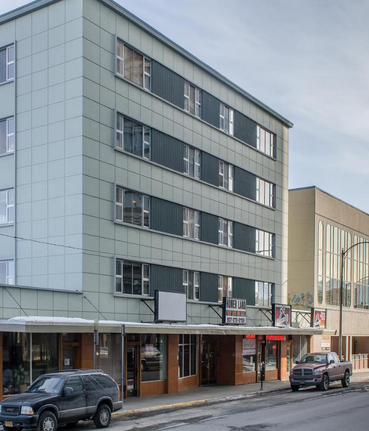 On the third floor of the Turnagain Arms building at 525 W. 3rd Avenue in Downtown Anchorage, AK is a great condo, especially for those that are looking for their first home. Condo #509 is a 643 square foot loft which has one bedroom and one full bathroom, and can be yours for the price of $157,000, along with $200 monthly HOA fees. Sounds nice, but why is it so special? One of the things that makes this condo so unique is its location. 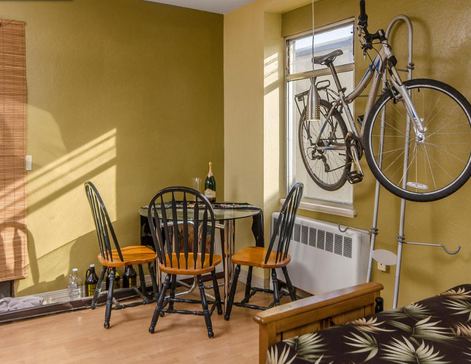 Turnagain Arms sits right in the middle of Downtown Anchorage, you’re within walking distance of just about everything this city offers. The building is just over 60 years old, but you wouldn’t know that from looking at this fantastic property. Everything’s been updated, from the laminate flooring in all 4 rooms, to the kitchen with its new cabinets, countertops, and appliances which come with the condo, the bathroom, and the bright, modern colors on the walls. A parking space is reserved behind the building, which has controlled access after 7 p.m. The building also has a common laundry room, a lobby in the front, and plenty of storage space for all your extras. The monthly HOA fees pay for plenty of amenities, including building maintenance, snow removal, water and sewer, condo insurance, and of course heat. Also, special financing is available for this great property. So, what does the area have to offer? Downtown alone has a lot to offer those who choose to live there. Within walking distance is the 5th Avenue Mall, full of great shops to enjoy. Downtown also has a lot of unique specialty shops for shopaholics. If you love parks, Delaney Park-better known as the park strip-and Hostetler Park are just a few blocks away: Delaney offers everything from soccer fields to an ice hockey rink in the winter, and several of the city’s memorials, while Hostetler offers great views of the city and Turnagain Arm. No matter what your interests, Anchorage has them all. From the city’s numerous museums such as the Alaska Native Heritage Center and the Alaska Museum of Natural History, to downtown’s bars, restaurants, art galleries, and clubs, there’s plenty to see and do. There are numerous events year round, from the start of the Iditarod sled race in early March, to the Anchorage Market & Festival on Saturdays in the warmer months, to the Anchorage International Film Festival in early December. So if you’re looking for a great starter home in Anchorage with easy access to everything and a good price, place a bid on this excellent condominium. You won’t regret living here!